While one could rattle off a multitude of different wine awards in the state of Oregon alone, few even attempt to encapsulate the entire industry in a format that is truly impartial and intentional in its attempt to promote the wine itself. Christopher Chan, Certified Sommelier and Executive Director of the Seattle Wine Awards, made it his personal mission to create such an award ceremony. Founded in 2008, The Oregon Wine Awards is designed specifically to highlight Oregon's wine industry and promote it on an international stage. Sure other wine awards may serve elephant ears or allow you to barf in porta potties after dropping your third glass, but The Oregon Wine Awards are serious business. This is especially important for the Oregon wine industry as while we may know some of the best wines in the world are grown and produced here, the reality is that our state's reputation is up against decades and centuries of tradition that rarely accepts newcomers. The results of this competition were released over the weekend and we couldn't be more excited to visit some of the winners. But what really makes The Oregon Wine Awards so special? Who judges this thing and why should I care? Ever wonder what happens behind the closed doors at wine events? Does The Oregon Wine Blog even know or are they just asking hypothetical questions at this point? Upon entering the facility, Christopher quickly greeted us and filled us in on what has been going on. While we had made it there around the crack of noon, the tasting panel has been hard at work all morning sampling various wines from around the state. One thing he wanted to hit home right away with is that the folks we were about to talk to are not part of a judging panel. "The program is not a competition, but a wine recognition program, which makes the job more straight-forward. By removing the presence of outside influence such as the label, winemaker, and vineyard, its an eye opening experience." This immediately resonated with Josh and I as it set a great tone for the rest of the day to fully understand where our panelists were coming from. What’s your process in doing a judging panel? Ron: You have to calibrate the palates at the first table, as you just woke up. You don’t want the first table to be different from the last. 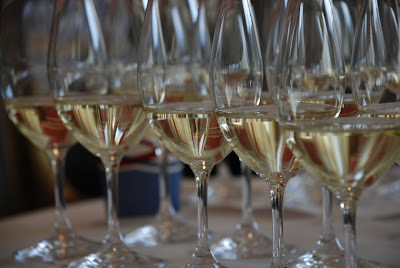 Wine tasting is like a memory, it’s a snapshot that is either blurry or crystal clear. Either way, you need to come back. 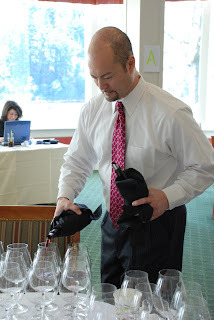 David: Being a wine judge sounds more glamorous that it is. You have to concentrate, it’s easy to get lost. The ability to remember wines over a period of years helps put it in context, specifically how Oregon fits with the world market. Cole: I look to find where Oregon wine places on the world scene. I learn from others. In rating wine, you must apply world standards, not just local. David: Sometimes there is dialogue at the tables, it varies from tasting to tasting. Some look for consensus, some don’t. Cole: Sometimes finding out what the wines are at the end of the process is really humbling. The tasting process is blind to label. These men have three of the most notable palates in the entire state and essentially we were told that tasting is based off of experience, it's a lot of work, their own tastes are completely subjective, and that new wine drinkers can often times offer the best perspectives on a wine. I know we've hammered in over and over how great of a wine industry Oregon has, but I highly doubt you would hear that kind of feedback from more established regions in the world. With introductions out of the way, we figured it was time to check out where all of the wine was stored. We can't share any photos, but we can explain a bit about what goes on. When entering the room, we were first greeted by Kyle, the Maitre’d at the Rainer Club, who assisting with the process. Even Kyle, with his breadth of wisdom and experience was blown away by how many wines were not just pinot gris or pinot noirs. In short, a giant interconnected system of tables housed every wine submitted to the competition organized by varietal and price point. 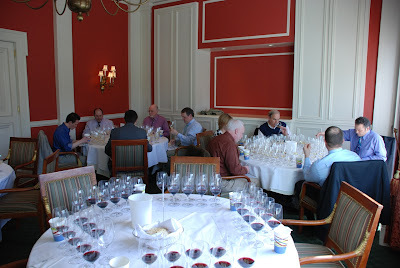 In total, 266 individual wines were displayed before us in what can only be described as a thing of beauty. Not just because Oregon wine is a beautiful thing, but also as a sign that Oregon wineries are legitimately supportive of this initiative. I guess it also helped that Josh and I were given free reign to taste whatever we wanted. After a few dozen tastings or so, Josh and I stopped by the palate cleansing bar (for real) and witnessed a bit of tasting by more sophisticated industry experts than ourselves. What's abundantly clear in this photo is that each flight that a member of the tasting panel has to try is quite robust and high in quantity. What this photo doesn't share is that each one of those glasses sits atop a number that corresponds with a wine in the secret wine room. Why is that important? Christopher shared with us that integrity of the tastings is of top concern. Not only is each wine painstakingly micromanaged enough to make sure each pour ends up in the correct glass, but each bottle is individually tasted to make sure that it isn't corked. The amount of effort that goes into the process is surreal. At the end of the afternoon, both Josh and I left with a sense that the Oregon Wine Awards really is a unique venture that truly has the entire Oregon wine industry in its best interests. 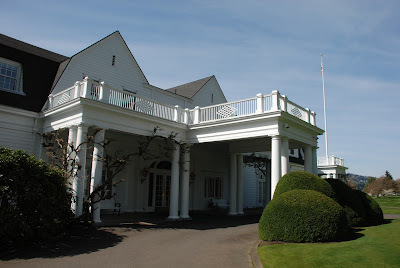 While the country club atmosphere seemed rather stuffy at first glance, the reality is that everybody from the Oregon Wine Awards to the staff of the Waverly Country Club were some of the most kind, hospitable people we had ever met. The setting is controlled and ensures the integrity of the program, thereby providing a real and unbiased rating for consumers. It’s clear that all judges are passionate about the wine and the process, and engage in an honest, ethical, and respectful fashion. We both look forward to next year and would like to thank Chrstopher and the staff at the Waverly Country Club for such a unique opportunity. Oh, and when you see a wine that has been well-rated by the Oregon Wine Awards, know you have a wine that has made it's mark in the industry, is a good wine, and good value. i'd like to twitter and facebook this. i can use the url, but in future it would be rad to have a link. lovely work in every sense. Thanks for the comment! What type of link are you hoping for? Maybe see some of you at WBC2010?